Property taxation is the closest most of us come to a double-edged sword. None of us like to pay more taxes, but many times, higher taxes are due to the fact the property we own is, in fact, worth more. A few months ago property owners across Iowa received their new property tax bills and many were surprised at the increased assessment and angered by the effect on their taxes. Most County Assessors try to make assessments as accurate as possible by making good use of available market data. But for Iowans, the assessed value is only half of the property tax equation. After the value of a property has been set, the property tax rates in each county are calculated in a multi-step process that includes budget submissions from each taxing authority including K-12 schools, cities, counties, and hospitals. Once the budgets are submitted, the County Auditor sets the tax rate by dividing the total amount of the budget by the taxable value of all the property in the taxing district. That rate is expressed as dollars per thousand of valuation. Cities are one of the larger taxing authorities and the rates levied by them have a large variation across the state. 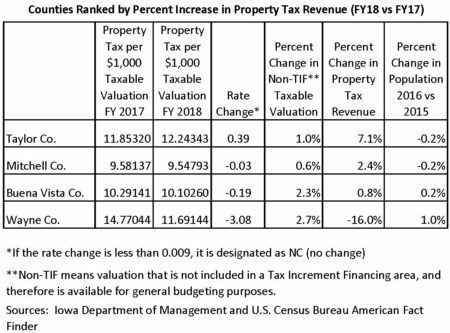 A recent excellent publication written by Gretchen Tegler of the Taxpayers Association of Central Iowa (TACI) ranked 16 central Iowa cities by their percent increase in property tax revenue from FY 2017 to FY 2018. Ms. Tegler’s report highlights two extreme and opposite examples in the cities of Waukee and Des Moines. Even though the city of Waukee has kept its tax rate constant for 18 years, the city will have a 19.5% increase in property tax revenue due to increased valuations and new properties coming onto the tax rolls. 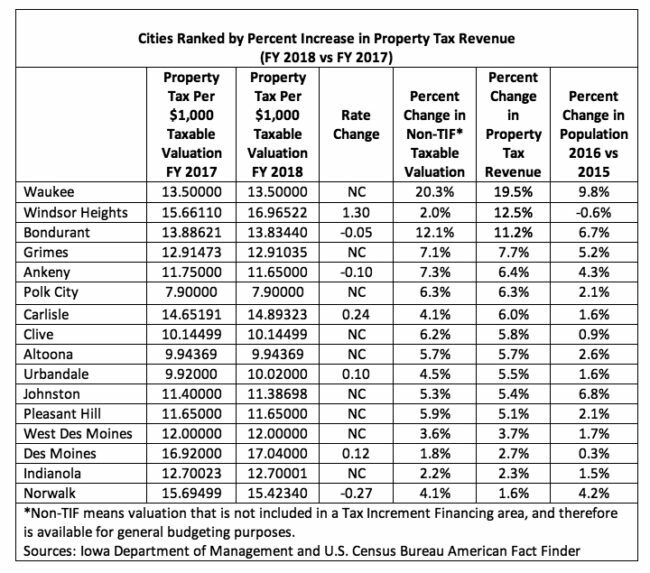 Des Moines, on the other hand, will have to raise the property tax rate just to realize a revenue increase of 2.7%. Iowa property taxes are complicated and they can be difficult to understand because of multiple taxing authorities, games that can be played between valuations and rates, changing populations, inflationary pressure, and the list goes on. Iowans for Tax Relief appreciates the good work of Taxpayers Association of Central Iowa and would like to share this same information for more communities statewide. 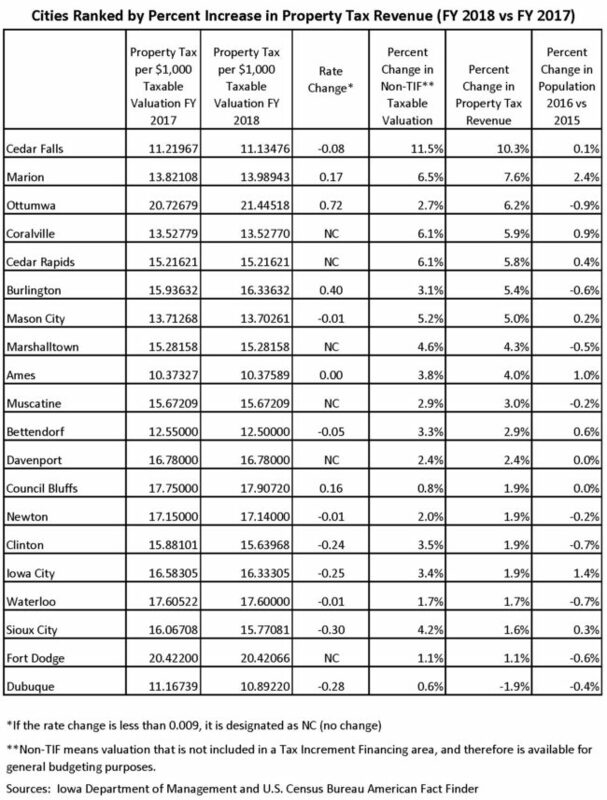 The tables below detail tax rates for FY 2017 and 2018, and the percent change in taxable valuation, property tax revenue, and population for the 16 cities of the Des Moines metro area (Table 1, courtesy of TACI), the 20 largest cities outside of the Des Moines area (Table 2), and four counties from across the state (Table 3). If your city or county is not included in the data provided in these tables, email us at ITR@taxrelief.org and we will provide you with your local data. It is always the right time to contact officials at all levels of government to make sure they are looking out for the interests of the taxpayer. Cities and counties that are fortunate enough to benefit from a growing population or an increase in taxable valuations have a unique opportunity to reduce the rates they are charging taxpayers. One possible way to ensure this would be enacting legislation at the state level that required automatic rate reductions in tax levy rates to partially offset increases in assessed values so that net property tax dollar increases would be limited.